Dashcam, a tiny little device is getting popular day by day. 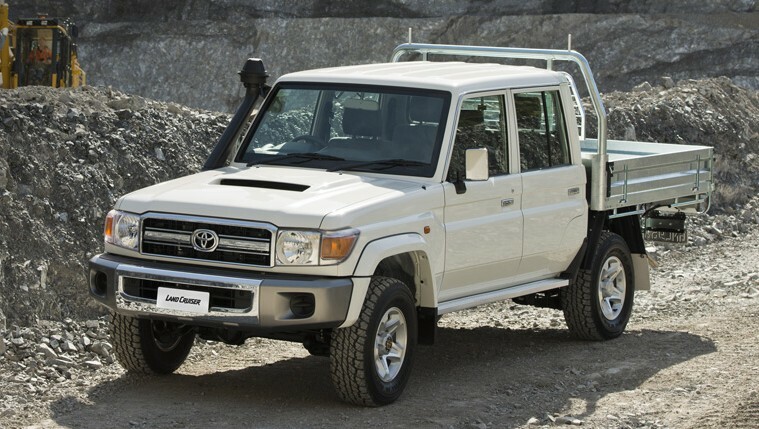 Transporters and commercial buses internationally must have one at front and back by law. My fellow blogger recommended a few days ago that we, Pakistanis, should start installing dashcams as well. The purpose of a dashcam is to keep records of any unfortunate event one can come across and Russian dashcam videos are more than enough to prove that. Most of the times, the videos we come across with nasty accidents are clear enough to understand who was at fault. 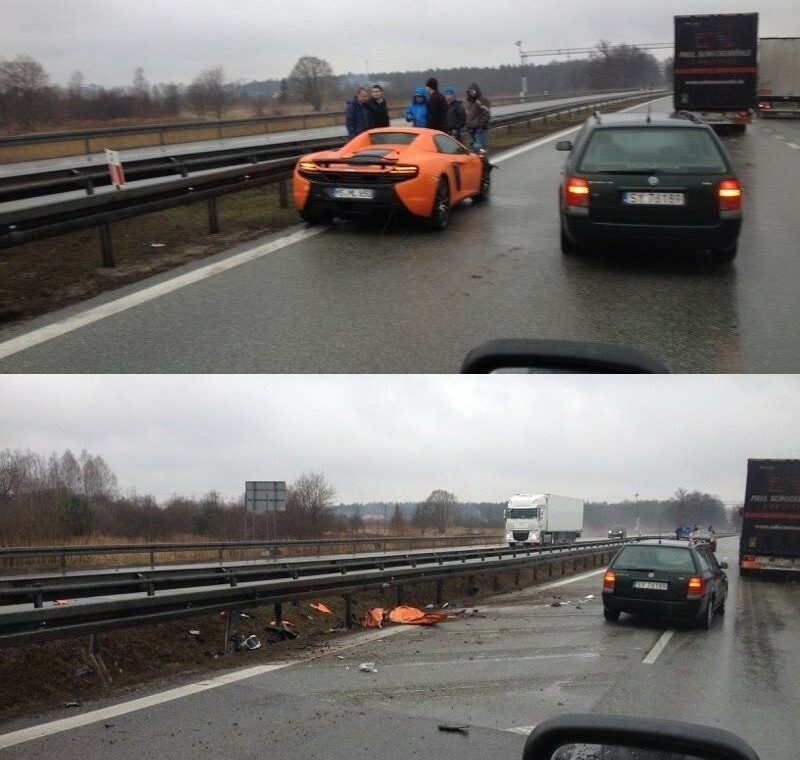 Remember that Lamborghini Crash @ 200 mph in Poland or Audi R8 crash caught on camera? 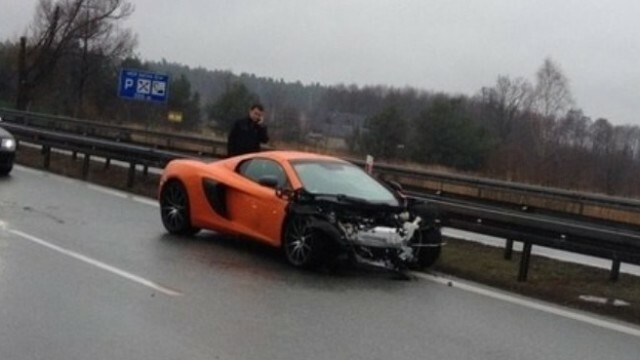 Now a new video of a McLaren 650S from Poland crashing has gone viral on the internet and the crash looks pretty bad. The car is 650 hp RWD, which can easily hydroplane and lose traction on wet roads, and this is what actually happened. A dashcam in a truck recorded this unfortunate event. It can clearly be seen that the super car was driving at speeds more than it should have been due to the prevailing wet conditions. As per the news, there are only two 650S (only one in orange color) in Poland and the same car was spotted at a car show sometime ago. Looking at the damage it seems the insurance company would write it off. The reason of the crash appears to be Hydroplaning, which occurs when a tire encounters more water than it can scatter which creates a thin layer of water between tires and the road, resulting in lost traction. At higher speeds (50 mph and higher), where the water cannot be pushed out of the way fast enough, the tire starts to ride up on top of the water. When a vehicle hydroplane, the driver has no control of the car’s direction. The tire can steer left or right, but without any contact with the road. If you brake during this state, the vehicle hydroplanes more. Hydroplaning can occur on any wet road surface, however, the first 10 minutes of a light rain can be the most dangerous. This video below should be another lesson and reminder that one must be very careful while driving in the rain. Driving in rain can be a fun and enjoyable but safety is always first.